Why Are There Only Old People Here? San Miguel de Allende, Mexico is hardly unheard of. A small city with colonial charm and perfect weather, San Miguel has been deemed livable, worthy, and above all, desirable by some of the top travel magazines in the world. Over time, like many places the world round, San Miguel’s industry has switched from agriculture to tourism and it now enjoys a steady annual flow of both domestic and foreign holidaymakers, many of whom attend classes at the city’s various art and language schools. San Miguel is also home to a considerable expat community, made up largely of artistically inclined retirees from the United States. As if that’s not enough, it has also played backdrop to several Hollywood movies, is the subject of countless photography books and is inhabited by a number of recognized artists, writers and designers. Like I said, hardly unheard of. So why does it feel like a retirement community? Yes the majority of expats and transplants are retirees, but that’s true in a lot of places. Surely a town with so much to offer would attract at least some young people, Mexicans and foreigners alike. And yet it’s eerily old here. After all, the only reason I’m here is because I can stay free in my grandfathers recently abandoned house. He is, you guessed it, a retired American artist. The house, which is a short five minute walk uphill from the city center, is elegant and lavish but has seen a great deal of change over the years. As a ten-year-old I remember looking out from it’s back balcony across a lonely canyon surrounded by rock-strewn hills to the cityscape beyond. The rock-strewn hills are still here, but they are no longer lonely. Once standing solitary in awkward defiance of the rugged landscape, the house is now crammed into a wall-to-wall community of gargantuan, stately homes, dwarfing its once awe inspiring stature. Creepily they are almost all empty. Here I am, twenty-something and broke living in an imported Texas suburb inhabited by no one. After many months I have yet to meet another human being my own age. I have come across a single under-forty expat and a few flirty waiters but am constantly surprised by the number of blue-hairs in the restaurants and galleries. Even the local service industry seems to bet getting on in years. And then I discover the nightclub scene. It turns out that San Miguel does have a sizeable population of young people. It just keeps them locked up until dark. A little cheap tequila and some economically priced shots of something pink and advertised as two-for-one is apparently the motivation they need to immerge from the walled-in courtyards and classrooms, or wherever it is that they hide away all day. While my night out reassures me of a somewhat balanced demographic I am still surprised by the absence of younger foreigners. Not that I want the place to turn into the next Cancun or anything, it’s just that I think people are missing something here. 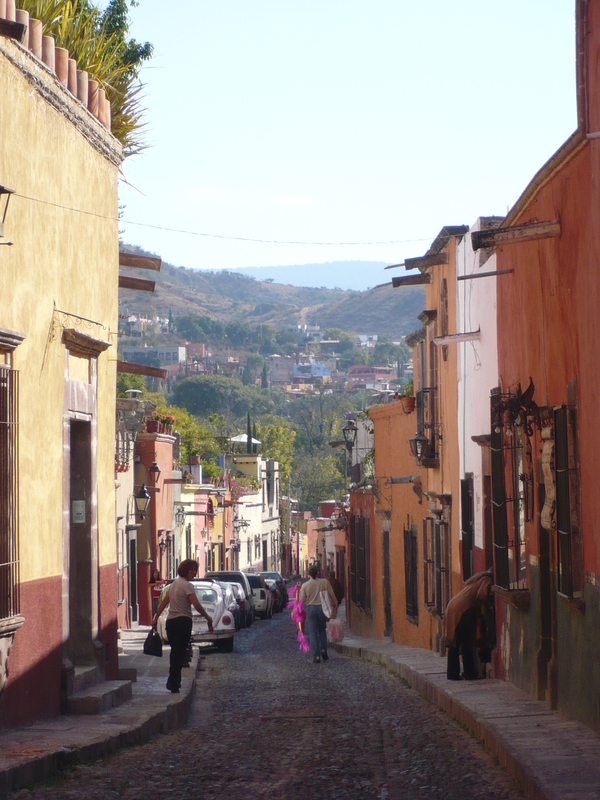 San Miguel is the Antigua, Guatemala of Mexico, but with a lot more class and a little less tack. It may very well be in my imagination but San Miguel feels just a little more “real” and a little less precious. It’s central park is brimming with vendors peddling all sorts of deliciousness from fresh-shaved coconut, to boiled chili-corn, made-to-order tacos, churros in melted sugary bliss, squash flavored ice cream and pickled pheasant eggs. Outside the main square, fancy looking but surprisingly affordable restaurants with rooftop bars offer all day two-for-one margaritas, served with a smile and a big bowl of cacahuetes (peanuts, I just love that word). The fruit/flower/meat market is many city blocks long and exudes the overwhelmingly mouthwatering smell of ripe guavas. 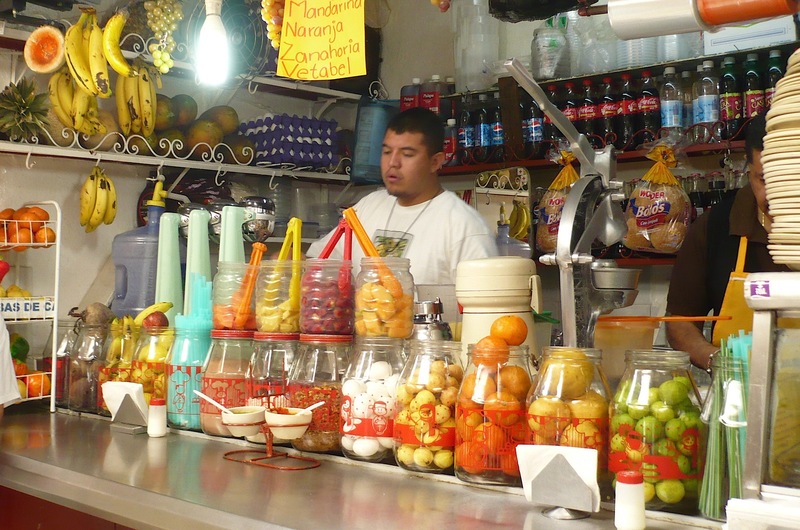 Here you can order gigantic, juicy liquados (blended fruit drinks) munch on greasy Mexican sandwiches or purchase a whole roasted chicken with handmade tortillas and fresh spicy salsa for diner. Meanwhile a stroll through the back streets just a few blocks from the city center will present you with more boutique jewelry shops, art galleries and craft stores than you can handle, dozens of hole-in-the-wall pastry shops (the best kind) and some sketchily awesome local bars. For a more high-end shopping experience there is also a great deal of designer clothing, soft leather, hand blown glass and locally made furniture to be had. And one can’t miss out on the hot springs or the bullfights! Whatever you love, San Miguel has it, except the ocean, which is the only reason I can’t stay. If you like Cancun, go to Cancun, and stay there, please, but if your looking for something a little different, equally as easy and safe enough to not make the news, San Miguel de Allende is your spot. Even if your twenty-something and broke!